Delivering rapid shifting for effortless acceleration, the 8-speed automatic transmission is highly responsive and smooth. Featuring a contemporary Satin Black rotary selector – the transmission offers even quicker shifts and sportier kick-down in Dynamic Mode, and earlier up-shifts in Eco Mode. You can also opt to manually control gearshifts, via steering wheel paddles at the touch of a finger. Two supercharged engines offer power and responsiveness throughout the rev range. Shared with the F-TYPE, the 3.0-liter V6 supercharged engine is available in both 340 hp and 380 hp versions on the XF, delivering instant access to high levels of performance and torque at all engine speeds, as well as refinement. Strong and light aluminum components make up both the front and rear suspension systems, helping the XF to respond with agility and to perform with dynamism while maintaining ride comfort. At the front, a double wishbone suspension structure, similar to that found in the F-TYPE, ensures exceptional steering feel. An integral link suspension system at the rear provides stiffness to support handling while offering great ride quality. 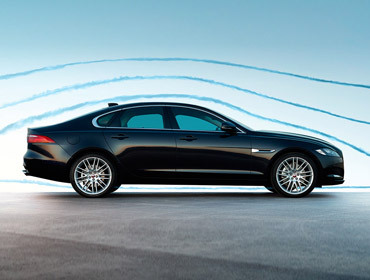 The control, agility and feedback offered by this suspension architecture ensure that the XF feels alive. The XF takes the renowned ride and handling of Jaguar vehicles to an even higher level. It delivers true sporting character while offering outstanding levels of refinement. This is thanks, in part, to its advanced aluminum intensive architecture, which delivers superb torsional stiffness and is the ideal platform for the advanced front wishbone and rear integral link suspension systems. 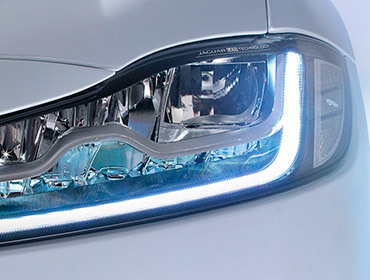 Optional adaptive LED headlights featuring Jaguar signature J-blade Daytime Running Lights give the XF a striking on-road presence. European model shown. 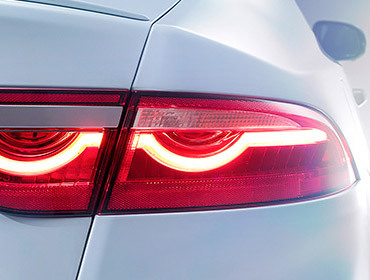 One of many exquisite exterior design touches is a unique pinstripe graphic on the distinctive, F-TYPE-inspired, LED taillights. The optional high-definition Virtual Instrument Display brings information to life – a 12.3-inch TFT screen replaces the conventional instrument cluster. This virtual display combines an outstanding new design with an entirely new graphical interface and more advanced functionality to make driving even more of a pleasure. You can choose from four pre-set display themes, or full-screen navigation, to suit your personal preference. InControl Touch Pro™ advances the XF technology to the next level by providing a 10.2-inch touchscreen in the center console and a customizable, High Definition, 12.3-inch TFT instrument cluster. Both screens provide user-friendly interfaces with a range of innovative features. These include a full-screen navigation display as well as natural dialogue interaction. Materials, leather and veneers are selected with the greatest care to ensure that, inside XF, everything is luxurious to the touch. Whether you prefer carbon fiber, or wood veneer finishes to complement the beautiful selection of available leathers, your XF will always look and feel just right. InControl Remote™ enables you to monitor your XF through your smartphone. It also allows you to track journeys, remotely lock/unlock your car, as well as remotely start the engine to heat or cool the cabin. InControl Protect™ includes SOS Emergency Call, which can automatically bring the relevant services to your exact location in the event of a critical situation. It also provides optimized Jaguar Roadside Assistance, transmitting your location and vehicle diagnostic data to help minimize delays to your journey. The available Autonomous Emergency Braking system utilizes a forward-facing camera to watch for a potential collision. If one is detected, the vehicle gives an audible forward collision warning. Visual warnings in the Head-Up Display (if fitted) and instrument cluster are also displayed. If a collision is still anticipated and the driver takes no action, the system is designed to then apply the brakes to help reduce the severity of the possible impact. These systems make parking in tight spaces easier than ever. Sensors measure the space and, if suitable, will enable the XF to accurately steer itself during either parallel or perpendicular parking maneuvers - the driver retains control of the brakes and accelerator. For parallel spaces, an exit-assist function can help guide the XF out again. Available Traffic Sign Recognition technology uses a forward-facing camera to detect speed limit and no passing road signs, and then displays them to the driver on the instrument panel. This system takes account of temporary speed limits. The Intelligent Speed Limiter, if activated, will use the signage information, alongside map data from the navigation system, to help keep the XF under the appropriate speed limit.